​Among the Annona (spp.) male and female flowers occur on the same tree at different stages of sexual maturity. In nature, insects handle the pollination. When hand pollination is practiced the pollen is moved from one flower to another by a person. The male flower in the photo is ready to shed pollen and is almost wide open. The flower on the left is in its female stage and just slightly open. Female flowers are generally most receptive early in the morning or when humidity is high. When people hand pollinate they usually collect pollen from male flowers and store pollen overnight in the refrigerator. You actually need just one male flower to pollinate several females. After about a week you should see petals sticking together and a small fruit should begin to develop about the size of a pea.. The following day a female flower is pollinated with the stored pollen. You can pollinate your Annona by inserting a fine artist brush with collected pollen into the female flower (flower on the left of image) so it makes contact with the stigma. It's important to keep in mind that the stigma is most receptive when relative humidity is high! Sometimes this can be done on the same afternoon. Seems to be very effective after a rainstorm. Find at least two flowers on your trees. Look for one male and a female. Pollinate female flowers as soon as they begin to open during the first opening of the petals for best success. High humidity and planting Annona trees near canals, lakes, etc seems to increase the odds for pollination to occur by hand or by insects.Some folks even hang a small basket of rotten loquat or other fruit to get fruit flies moving in and out of the flowers. Remove the basket after a few days to avoid a severe fruit fly infestation. As with most all flowers and pollination some important points need to be understood. First understand that flowers send out signals to insects. Flowers have a fragrance you may not sense but insects will. These scents are often referred to as pheromones. A second point is that flowers provide nectar and of course pollen. The nectar is not present in Annona species based on my research. I may be wrong so please feel free to correct me if you are more educated than I on this subject. Sap beetles (Nitidulid) are often seen working and moving around and inside the flowers of Annona (Spp.) I have seen these black beetles often and they are sometimes noticed in pairs hanging on the petals and inside the flowers. Lisa and Geffner Atemoya trees have self compatible pollen and can set fruit with or without hand pollination if an insect gets involved. It is commonly agreed that fruit will be larger and better shaped with complete pollination by either human or insect intervention. Cross pollination is the ideal situation for highest fruit productivity and fruit size. The Atemoya Flowering season begins in April and continues for about six to eight months depending on weather conditions. 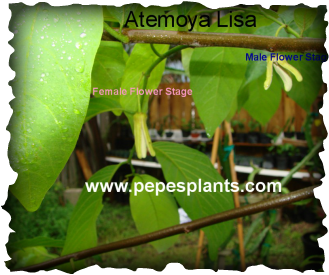 The Atemoya tree is a hybrid of Cherimoya and Sweetsop. This tree is hardier and is well suited for South Florida and mature trees can be grown in areas of Florida with temperatures as low as 26 degrees. Several varieties are available and some are still being evaluated. Improved cultivars include Geffner and Lisa. Lisa is a result of the work of Mr. Gary Zill and Har Mahdeem. Note: C. dimidiatus is just one of many sap beetle species. The Annona trees discussed here are located in Homestead Florida only 50 yards away from large plantings of corn fields. The Nitidulid C. dimidiatus is a pest of corn crops. This may explain how one pest can be a beneficial in other ways! Lisa aka: 48-26 produces grayish red colored fruits that are sweet and delicious! Atemoya Lisa is described as hyper- productive and will set fruit quiet heavily. Be sure to remove small mis-shaped fruits and fruit at branch tips. Leave fruit at the base of branches. Fruit growing at the base of branches will taste better and be less likely to cause limb breakage. Young trees should be pruned in March as buds break, just before new leaves begin to grow. Atemoya also benefits from a June pruning. Pruning in June stimulates additional flowering and fruit production. Do not prune the trees in the winter months. Atemoya trees can be kept between 8 - 10 feet high. Cherimoya (Annona Cherimola) This tree produces white fleshed custard like fruit that is sweet and delicious. This tree is not suited for Florida and grows best in California, Santa Barbara. The lower humidity and sufficient chill hours per year available in California make this tree, from the valleys of Peru and Ecuador feel right at home. So what can we grow here in Florida? This fruit is considered the ugly duckling of the Annonas. The fruit shape varies considerably from round to heart shaped and even oblong. This fast growing tree is well suited for South Florida. The flavor is sweet but not as delicious as its relatives. The custard apple is heavily attacked by the chalcid fly. Many if not all of the fruits on a tree may be mummified before maturity. Growing this tree can cause an increased population of chalcid flies to damage your other annona species. We don't grow this tree and recommend you don't either! It is often sold as a Cherimoya tree and many believe it is Cherimoya when they buy it. It is not a Cherimoya! Sweetsop (Annona Squamosa) or sugar apple is a relative of Cherimoya usually grown from seed and well adapted to South Florida. Most seeds are true to type. The trees average 15 ft high. Not hardy below 29 degrees f. This fruit is sweeter and knobbier than Cherimoya but not as creamy. Sugar Apple trees are very drought tolerant and should not be over watered. High humidity around the trees leaves is beneficial but heavy rains can cause fruit to split on the tree. Pick mature fruit and allow it to soften on your kitchen counter before eating. Soursop is another Cherimoya relative (Annona Muricata).This tree averages about 20 feet in height. 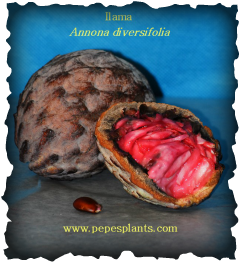 The fruit is the largest of the annonas and can weigh more than 5 pounds. The fruit is considered to be one of the finest for making sherberts because of its delicious flavor. Some people describe the flavor as a blend of pineapple and mango. This tree is propagated by seed and occasionally, grafted varieties are available. Trees propagated from seed produce fruit in about two years. One of the best varieties is called Fiberless Cuban. The tree is also called Guanabana by most Cubans, Puerto Ricans, South and Central Americans. In other parts of the Caribbean like Jamaica it is known as Graviola. Soursop can be grown in South Florida but young trees must be protected from the cold. Trees are damaged by temperatures near 42 degrees and they will not tolerate freezing! Plant near the south side of a property and provide some additional wind protection. Seeds can be toxic don't eat them or blend them into shakes or smoothies!! Ilama (e lama) is the common name of this amazing fruit. The flavor is unique. ​I have tasted them several times and find them sweet with a rich complex flavor. This tree is for the more experienced grower. You probably won't see many of these trees for one main reason. Even as great tasting as it is, the fruit has one major drawback. The fruit splits on the tree when ready to eat. To the average person this is an unsightly reason to stay away from the fruit. Well as far as I am concerned that just means more fruit for the more adventurous fruit lover. These trees are deciduous, this means they loose leaves in winter. Do not water your trees when they have lost leaves! Trees in the Annona family are not tolerant of flooded soil and saline conditions. Pond apple is an ecologically important Florida native that is also related to Cherimoyas. The tree grows in the water of the everglades and some people say the fruit is edible. Well, I (Pepe) tasted one and did not like it at all. YUCK! ​"Friends don't let friends eat Pond Apples, instead, real friends will offer you sweet delicious sugar apples!" with either an 6-6-6-3 or you could use 8-3-9-3 or similar. Mature trees: 1-3 lbs is applied 4 times per year. Maximum of 15 lbs per year. Do not fertilize in winter!